Cloud solutions for browser gaming enable enterprises to develop advanced and unique games with better user experience and response times at low operational and maintenance costs. From a development perspective, browser games require tiered client/server architecture, network protocols, security and database design. The server needs to handle and verify a huge number of connections, apply changes for it to evolve and to prevent cheating. It is also imperative to have a system that records and backs up game data at regular intervals, without causing any hindrance to gameplay. The server architecture for most traditional browser games uses a two-layer design with a logic and database layer. 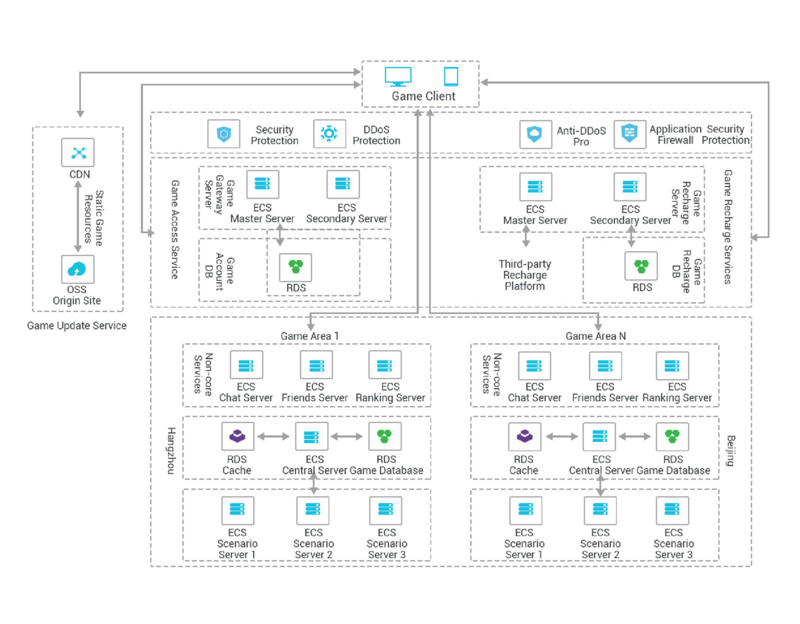 The simplest deployment model would be a game service composed of one ECS plus one RDS instance. CDN and OSS build an enhanced distribution service, which helps with acceleration of static browser game content, such as textures, UIs, audio, and special effects. CDN nodes are available at hundreds of locations covering China and other global regions. Server designs can create a typical three-level architecture, including an access, logic, and data layer. SLB can perform load balancing for each layer, preventing service unavailability caused by a single-point-of-failure. DRDS and RDS offered by ApsaraDB for RDS helps build a distributed database that supports high read/write concurrency. Read case studies and learn more about the application of Alibaba Cloud browser gaming solutions. Download the browser gaming cloud architecture PDF.